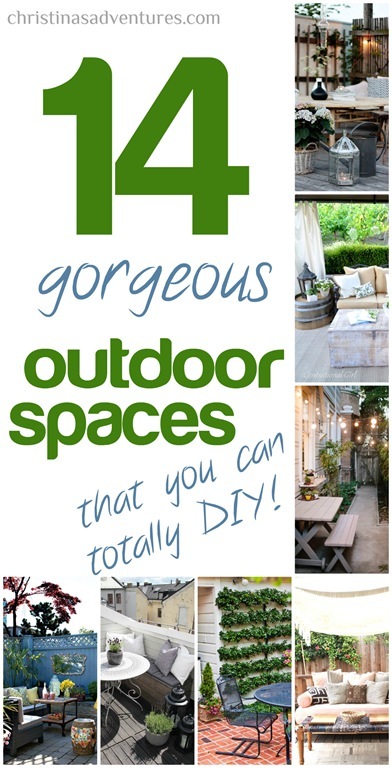 14 Gorgeous DIY Outdoor Spaces – inspiring porches, patios, all able to be done on a budget to up your curb appeal and update your exterior this spring and summer! It’s (finally) warming up outside, which naturally has me thinking of how I’m going to make over our very blank slate outside. I just sold our picnic table & chairs, and I’m looking for inspiration for our space. When I looked for inspiration on Pinterest, it seemed that every amazing space had 20 foot ceilings, a massive stone fireplace, and a million dollars simply sitting in a stack on an end table. Kidding. Kind of. 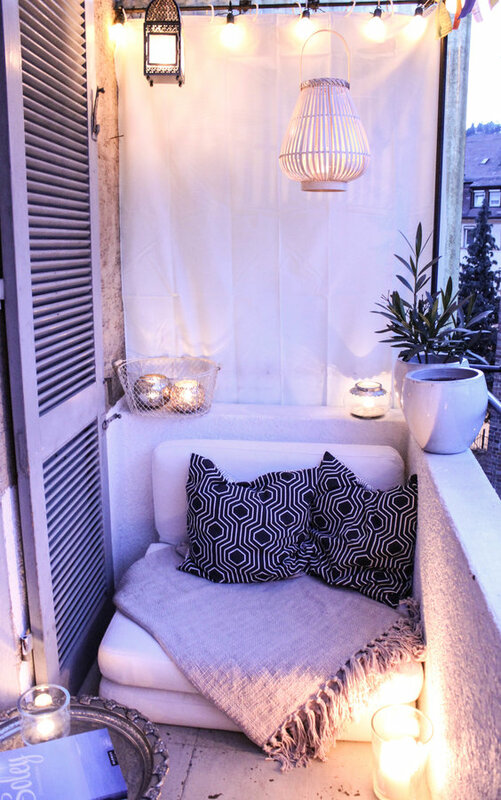 I took some time to look for realistic inspiration for my outdoor space – on a very tight budget as usual. Turns out, you can have a beautiful space without spending a huge chunk of cash! 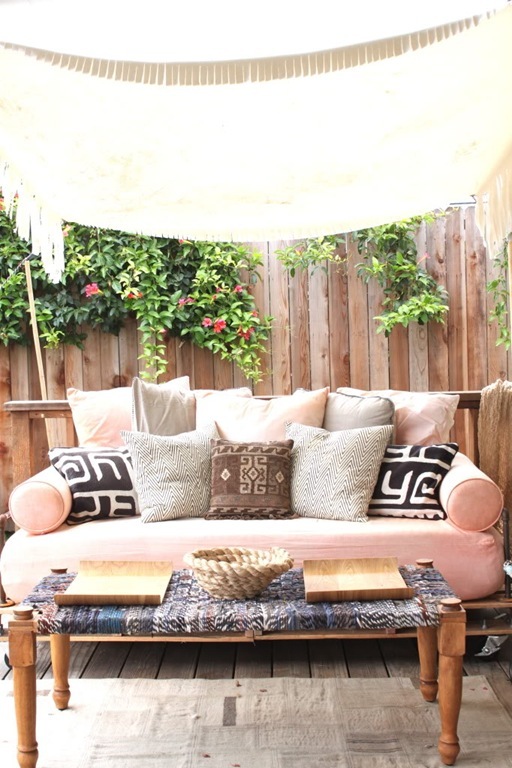 I really love the curtains and bamboo blinds in this outdoor space– that could be done pretty easily! This living garden wall is a great use of space – and it’s beautiful! You could make your own out of pallets! This DIY porch makeover is filled with plants and colorful accents- I love all of it!! The painted chandelier and the frame filled with hanging pots look like fun projects! Here’s another gorgeous use of a mirror outside! Who says you need a big space? This small porch is so charming and cozy! I always loved the Traci’s back porch transformation – the faux “tile” stained concrete is brilliant – and I just love the lanterns hung on those columns! Oh hello gorgeous simplicity! It’s pictures like this that make me want to get rid of everything in my house and live in a white décor bubble with lots of fluffy pillows. Does this make anyone else think the same thing? No? Mmmkay, moving on. 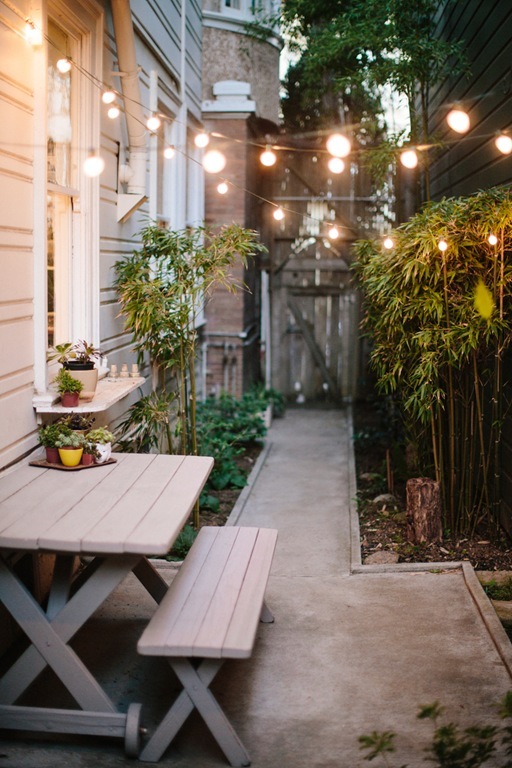 I just love the ambiance of lights strung outside – it just adds warmth to a space instantly! I love the idea of hanging mirrors outside. Wouldn’t you have to be careful the sun does not shine directly on it, reflecting back and starting a fire?